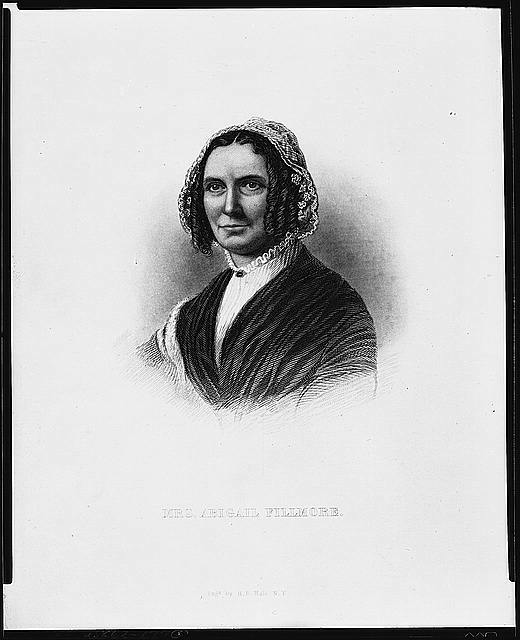 First of First Ladies to hold a job after marriage, Abigail Fillmore's most striking personal characteristic was eagerness to learn and pleasure in teaching others. Her husband has not been considered a memorable president, but she is perhaps best known as the First Lady who created the first White House library. Yet no matter her husband’s presidential record, when Abigail Powers Fillmore set up that library she was merely following a lifelong love of literature and books. Born in March, 1798 in New York State, Abigail was the daughter of a Baptist pastor and from early childhood absorbed her family’s love of their faith and education. Rev. Powers died when Abigail was still young and her mother and siblings moved to the country to stretch their limited funds. However, though her father had not left much in financial resources, he had left his family a large library of books. It was this resource as well as her mother's intense dedication to providing her children the best education possible that helped Abigail and her older brother achieve academic success.